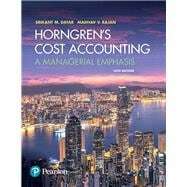 by Datar, Srikant M.; Rajan, Madhav V.
Horngren’s Cost Accounting , 16th Edition is also available via Revel™, an interactive learning environment that enables students to read, practice, and study in one continuous experience. Learn more. Srikant M. Datar is the Arthur Lowes Dickinson Professor of Business Administration at the Harvard Business School, Faculty Chair of the Harvard University Innovation Labs, and Senior Associate Dean for University Affairs. He previously served as Senior Associate Dean from 2000 to 2010. A graduate with distinction from the University of Bombay, he received gold medals upon graduation from the Indian Institute of Management, Ahmedabad, and the Institute of Cost and Works Accountants of India. A chartered accountant, he holds two master’s degrees and a PhD from Stanford University. Datar has published his research in leading accounting, marketing, and operations management journals, including The Accounting Review, Contemporary Accounting Research, Journal of Accounting, Auditing and Finance, Journal of Accounting and Economics, Journal of Accounting Research, and Management Science. He has served as an associate editor and on the editorial board of several journals and has presented his research to corporate executives and academic audiences in North America, South America, Asia, Africa, Australia, and Europe. He is a coauthor of three other books: Managerial Accounting: Making Decisions and Motivating Performance, Rethinking the MBA: Business Education at a Crossroads, and Rethinking Graduate Management Education in Latin America. Cited by his students as a dedicated and innovative teacher, Datar received the George Leland Bach Award for Excellence in the Classroom at Carnegie Mellon University and the Distinguished Teaching Award at Stanford University. Datar is a member of the board of directors of Novartis A.G., ICF International, T-Mobile US, and Stryker Corporation, and Senior Strategic Advisor to HCL Technologies. He has worked with many organizations, including Apple Computer, Boeing, DuPont, Ford, General Motors, Morgan Stanley, PepsiCo, Visa, and the World Bank. He is a member of the American Accounting Association and the Institute of Management Accountants. Madhav V. Rajan is the Robert K. Jaedicke Professor of Accounting at Stanford University’s Graduate School of Business. He is also Professor of Law (by courtesy) at Stanford Law School. From 2010 to 2016, he was Senior Associate Dean for Academic Affairs and head of the MBA program at the Stanford GSB. Rajan received his undergraduate degree in commerce from the University of Madras, India, and his MS in accounting, MBA, and PhD degrees from Carnegie Mellon University. In 1990, his dissertation won the Alexander Henderson Award for Excellence in Economic Theory. Rajan’s primary area of research interest is the economics-based analysis of management accounting issues, especially as they relate to internal control, capital budgeting, quality management, supply chain and performance systems in firms. He has published his research in a variety of leading journals, including The Accounting Review, Journal of Accounting and Economics, Journal of Accounting Research, Management Science, and Review of Financial Studies. In 2004, he received the Notable Contribution to Management Accounting Literature award. He is a coauthor of Managerial Accounting: Making Decisions and Motivating Performance. Rajan has served as the Departmental Editor for Accounting at Management Science as well as associate editor for both the accounting and operations areas. From 2002 to 2008, Rajan served as an editor of The Accounting Review. Rajan has twice been a plenary speaker at the AAA Management Accounting Conference. Rajan has received several teaching honors at Wharton and Stanford, including the David W. Hauck Award, the highest undergraduate teaching award at Wharton. He teaches in the flagship Stanford Executive Program and is co-director of Finance and Accounting for the Nonfinancial Executive.He has participated in custom programs for many companies, including Genentech, Hewlett-Packard, and nVidia, and is faculty director for the Infosys Global Leadership Program. Rajan is a director of Cavium, Inc. and iShares, Inc., a trustee of the iShares Trust, and a member of the C.M. Capital Investment Advisory Board.